Sorry its been so long between posts … after our return back to India I had quite a lot of start-of-year, post-vacation work catch-up to do, including preparation for our IBM Connect 2014 show in Orlando. Now its been 9 days since my return from a 9 day stay in the US, and jet-lag is only now dissipated. 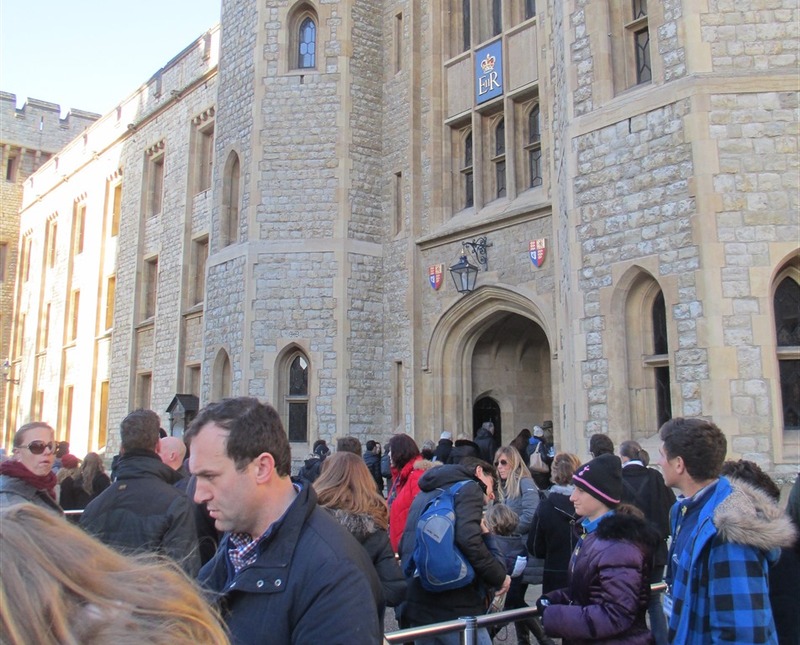 We saw a lot of sights on our London trip … one of which being the Tower of London, so here I share some pictures and thoughts. 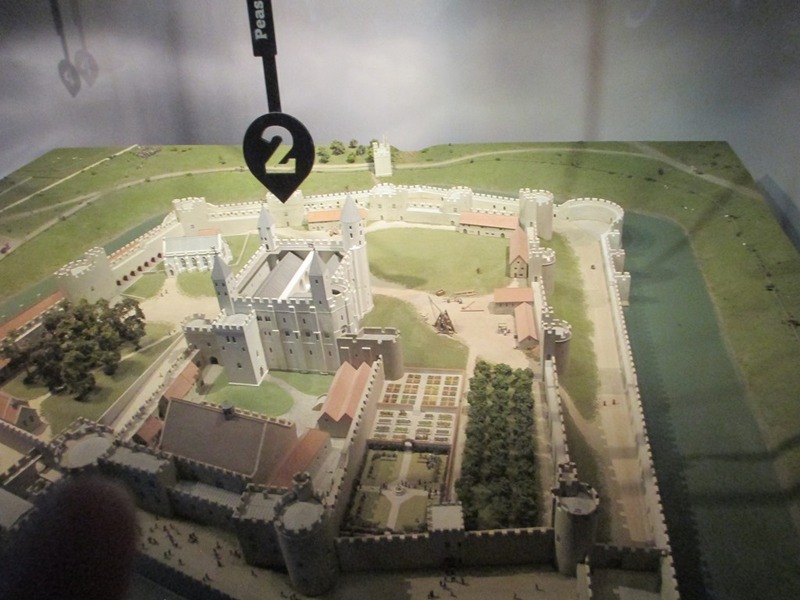 Seeing this I remarked, “That’s where we were!” – meaning, the Tower of London. Suddenly the tube maps I had looked at, and all the place names I had heard of somehow fell into place as I realized modern Londoners have a mental map of their city not unlike what Shakespeare himself must have had. How different from a place like Pune, where 90% of what you see is new since the mid 90s, and long-time residents have often have trouble recognizing where they are. The Tower is not a single castle or building, it is several all enclosed by a bordering wall. 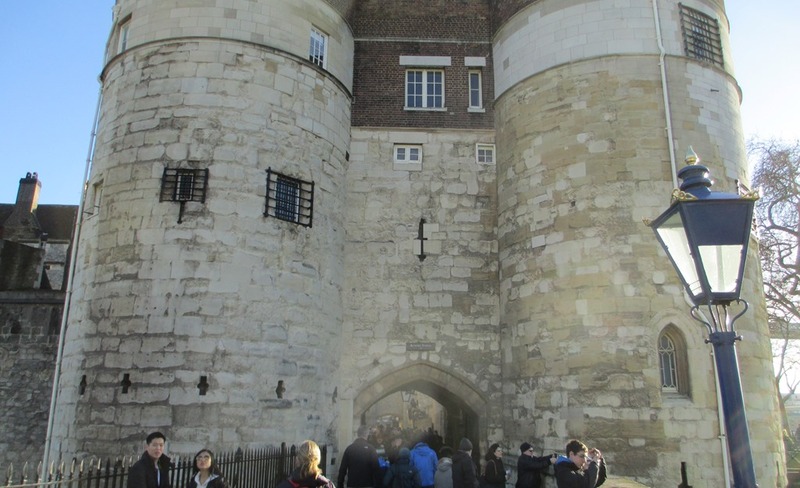 The largest is the White Tower (the center pic above) which was build by William the Conqueror in the 11th century, and so is the oldest part of the overall Tower. 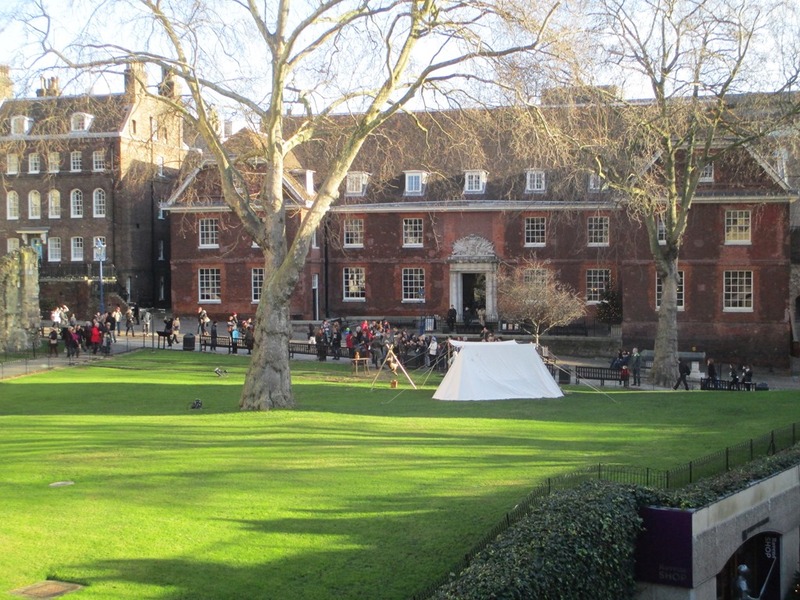 Inside the grounds are many buildings built over the centuries, and in some places historical staff re-enact medieval life, like the campsite in the picture on the right. 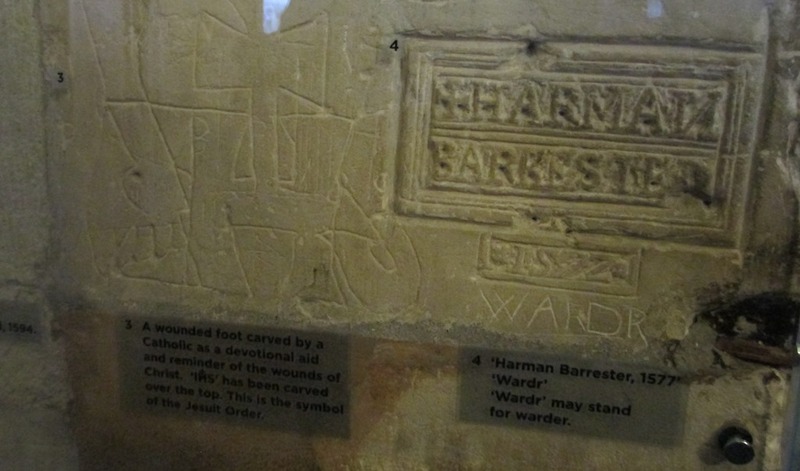 Above left are some carvings made by Catholic prisoners in the 16th century; these are in the Salt Tower, a series of plain stone cubicles and stairways. Rather more comfortable where the apartments assigned to Sir Walter Raleigh, who was imprisoned in the so-called “Bloody Tower” (where supposedly Richard III murdered his young nephews) from 1603 to 1618. 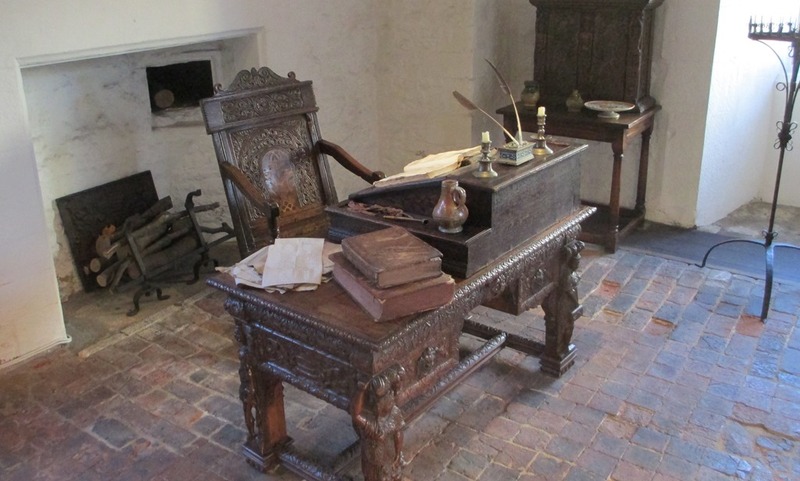 Raleigh’s desk, shown above, is where he authored his “History of the World”, an ambitious work if there ever was one. 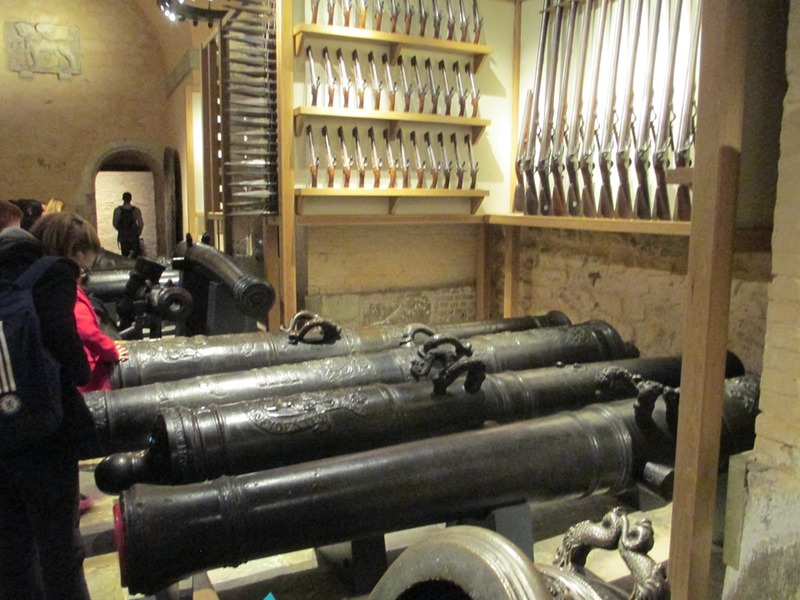 These are maintained in the “Jewel House”. 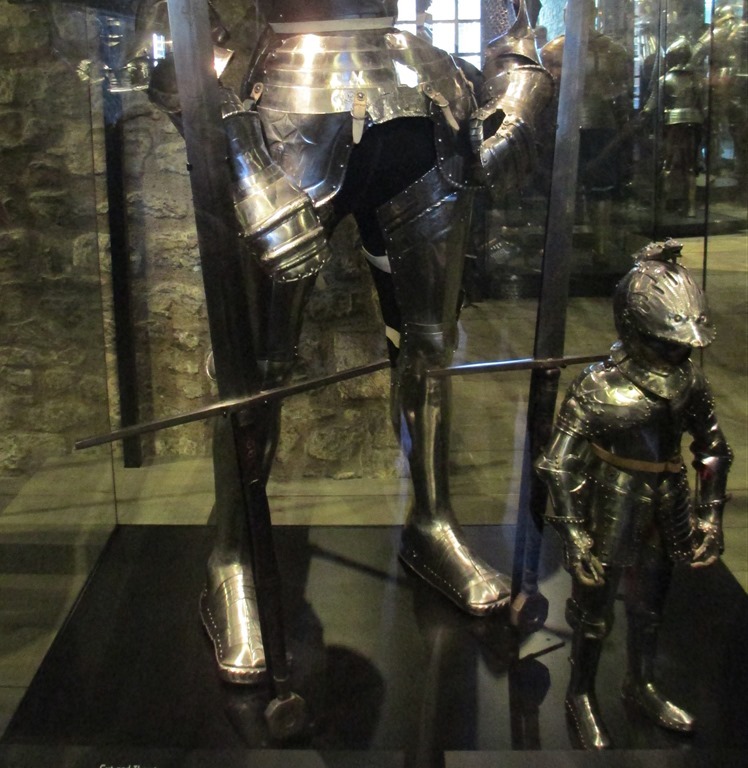 Since these are the top attraction for visitors to the Tower, there very wisely is a system of managing the flood of visitors. Railings allow the crowds to queue in an orderly fashion, then every 30 mins or so another batch of regalia-hungry tourists will be allowed to enter. 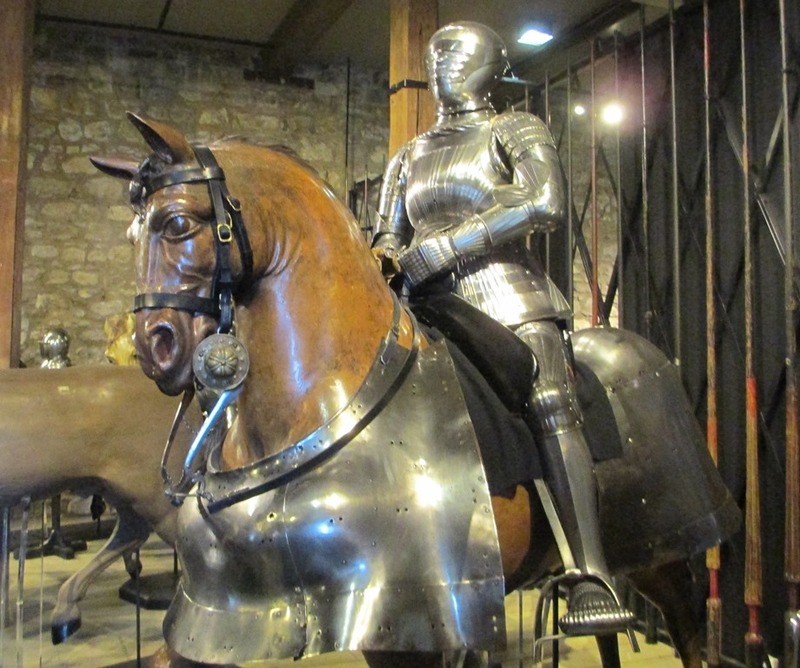 Photos are forbid inside – I will only say there are one or two knick-knacks therein I would not mind having for my own, not the least of which was the Wine Cistern, a mind-numbingly gaudy punchbowl that holds 144 bottles of wine and weighs over 250 kg – in 18-karat gold no less. 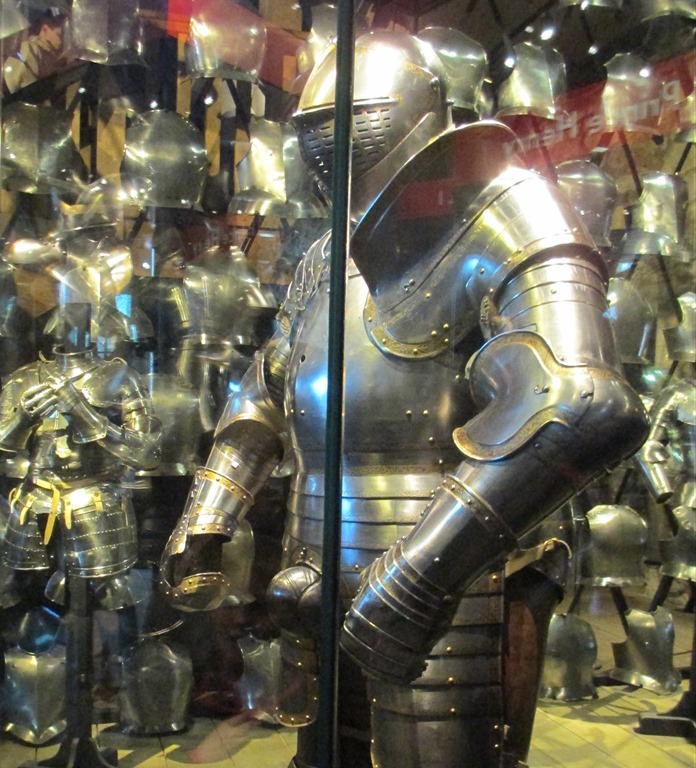 On the top right is one of the armors of Henry VIII, famous (or infamous) for its codpiece. 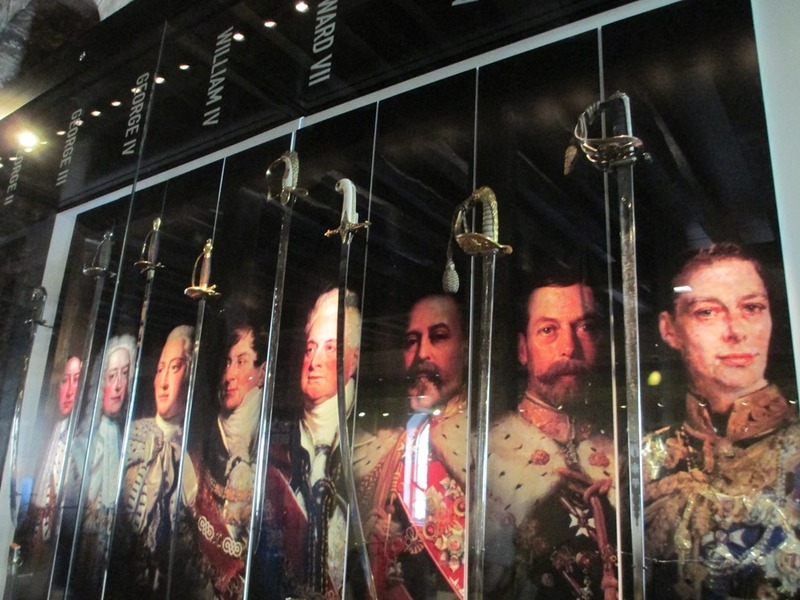 Quite interesting was the display of swords of Kings of England, beginning from George III. 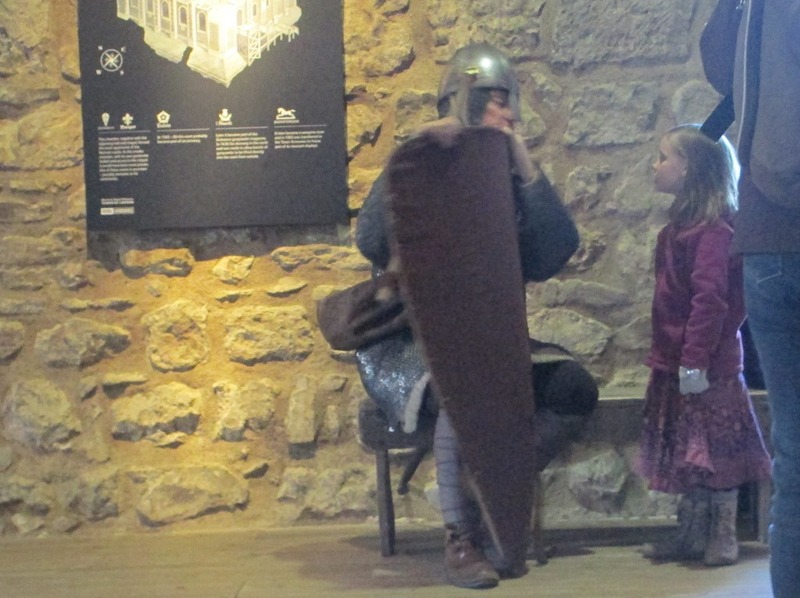 Here a re-enactor, garbed as a warrior from Williams the Conqueror’s time, explains a bit about medieval life to a young visitor. 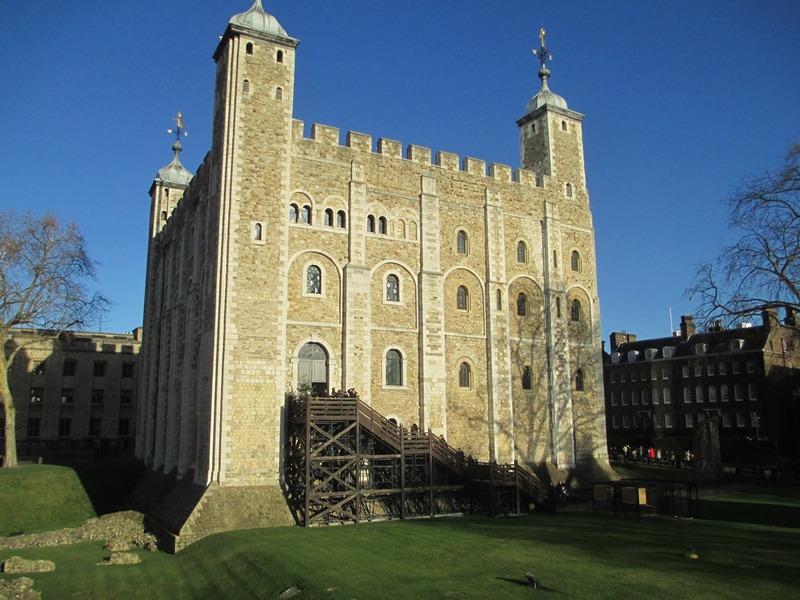 The Tower really is like that – live history that is all at once workaday and amazing. 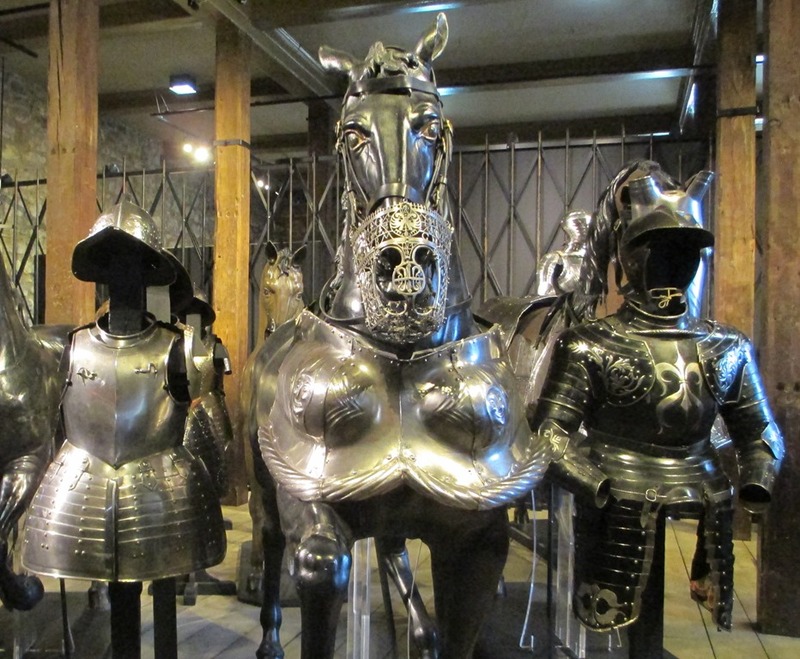 Soon, a final London post, about the Victoria and Albert.